I’m quite particular when it comes to cookbooks, especially Southern cookbooks. For instance, my favorite most recently purchased book is John Besh’s “My New Orleans”. It’s a beautiful compilation of amazing images, stories and delicately executed recipes. It seems to me everyone these days has turned around and published a cookbook, most of those books being just down right awful. 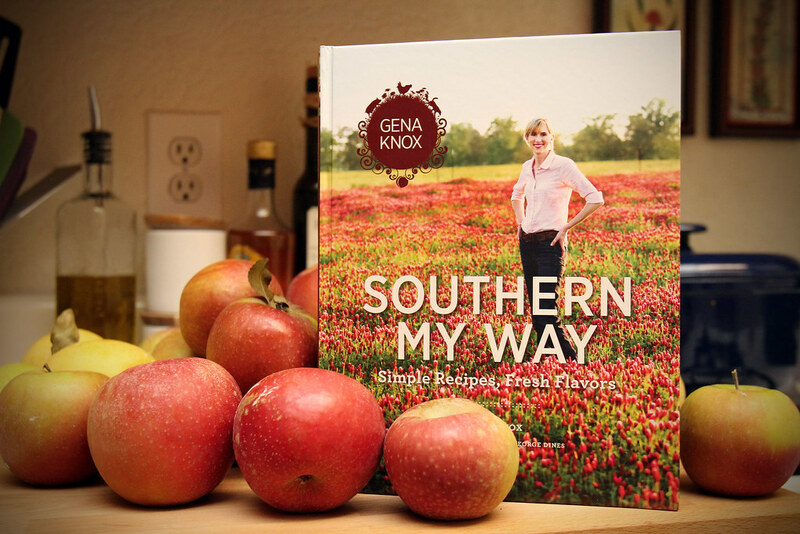 Southern My Way : Simple Recipes, Fresh Flavors by Gena Knox thankfully is not one of those books. Gena Knox, a Georgia native, accomplished cook, writer and entrepreneur and now serial cookbook author has a lot to be happy about. Gena has used her professional skills and Southern experiences to create a wonderful recipe collection that moves away from the current trend. My biggest complaint about cookbook trends is that they follow cooking show trends, most of which are centered around a “short-cut” recipe mentality where the author is advising the reader to substitute a canned or packaged ingredient to save time over cooking something from scratch. “Southern My Way” is true in every sense of the words. This book is 252 pages of Southern goodness, including beautiful pictures, wonderful Southern recipes ( all from scratch) and one of my favorite touches, warm personal stories including some about local Southern producers such as Sweet Grass Dairy, and Savannah Bee Co. There is a wide variety of recipes, mostly focused on using fresh ingredients in Southern recipes. The book is well organized into sections such as starters, soups, salads, lunch, etc and each recipe includes prep time, cooking time, yield and a very easy set of ingredients and instructions along with a short reason for why Gena included each recipe. Plus, Gena included pictures of her Boykins, and because I have a soft spot for the Southern dog of South Carolina,the Boykin Spaniel, this book gets the Hungry Southerner seal of approval. In the end you won’t want to miss the: Grilled Bacon Wrapped – Quail, it’s fantastic and delicious and easy to follow; Vidalia Onion Soup so sweet and perfect for the fall; and finally the Bourbon Peach Bread Pudding it’s peachy and bourbony so it’s wonderful. Southern My Way about sums it up, for The Hungry Southerner. All from scratch, from local, fresh ingredients and including a few family stories. I think we can all relate to that. I can’t recommend this book more, 5 out 5 Strips of Bacon. Stay Hungry Y’all! Thanks to the great folks over at Fire & Flavor they were nice enough to donate a copy of Southern My Way : Simple Recipes, Fresh Flavors for us to give away to our great readers so that’s just what we are going to do and on top of that we’ll also include a Hungry Southerner T-Shirt . There are 3 ways to enter: 1) leave a comment below telling us your favorite Southern ingredient to cook with and what dish to use it in 2) follow us on twitter @hungrysouthernr and #SouthernMyWay thanking @GenaKnox 3) become a fan of us on facebook ! We’ll announce the winner here in 1 week. You can enter all 3 ways ways to increase your chances! Spread the word! My current favorite ingredient has to be blackeyed peas. For the moment at least. I saw this cook book just the other day and flipped thru it. Indeed it does look wonderful. My personal favorite right now though is The Lee Bros massive tome Southern Cookbook. What else? Pecans! In pie! I have been using a lot of brown sugar lately. It is a great ingredient to use in everything from BBQ sauce to making sweet tea to making up a dry rub. No problem…spread the word…! We love Southerners and Gena’s book is worth Sharing! Grits, grits, grits. By themselves, preferably soaked in butter. Or cheese. I haven’t met an iteration of grits I haven’t liked. Can you have 2 favorties? If so, i’m all about butter & cream cheese lately…it’s why i live at the gym 5 days a week. I’ve been doing a lot of baking: my Mama’s pound cake & a sour cream cheesecake specifically. But i could put cream cheese in just about anything. Last week i made my mother-in-law’s cream cheese chicken enchiladas. Tonight i’m making homemade tomato soup w/ a dollup of cream cheese-delicious! Bacon drippings. It doesnt matter what you cook using the bacon fat, from egg and hash browns to steaks in a cast iron pan, it makes everything better. This cookbook looks interesting. I need to make a run to the bookstore so I can flip through it. My ingredient would have to be bacon. It adds flavor to a lot of southern dishes & belongs right up there with salt & pepper!! I’m new to the South! Having spent all of my life West and in the desert I’m learning my way around the southern kitchen. So it seems that the Southern ingredient I am most familiar with is BACON! My new favorite ingredient is buttermilk. I made southern pork chops with buttermilk gravy last weekend. Wow!